In the realm of $200 cameras, Sony’s Cyber-shot DSC-W230 distinguishes itself from the pack with a beautiful 3-inch LCD screen, a wide-angle lens, great in-camera features, and easy-as-pie access to scene modes. The 12-megapixel DSC-W230 is well-constructed and looks sharp, too. It’s available in four colors: blue, black, red, and silver. Its 4X optical-zoom Carl Zeiss lens offers a 30mm film equivalent on the wide-angle end, with 120mm on the telephoto end. One thing I liked about the design, apart from pure aesthetics, was the mode dial on the back of the camera. Rather than having to dive into the on-screen navigation, the dial provides instant access to 10 modes such as Smile Shutter, Intelligent Scene Recognition, Auto, High ISO, and Easy Shooting, which includes basic on-screen primers as to which settings are being selected. The star of the show on the back of the camera, however, is the 3-inch-diagonal LCD: It’s very sharp and very bright, and has great resolution. Joining the display on the back of the DSC-W230 are the aforementioned mode dial, a playback button, a four-way directional pad for navigating on-screen menus (the pad also doubles as one-press controls for the LCD’s brightness, macro mode, flash, and timer), a dedicated menu button, and a home button. That’s a lot of controls, but they’re spaced nicely and are easy to use, even for big hands. The DSC-W230 has a 3-inch LCD. Yet another appealing touch is the DSC-W230’s slide-show feature, which lets you add your own music or select from eight preset music tracks while you play back images on the LCD screen. The camera has plenty of juice to operate all that stuff, too. In our battery testing, the W230 took 310 photos on a single charge of its rechargeable lithium ion battery, earning it a battery life score of Very Good. The DSC-W230 also has optical image stabilization, but it didn’t appear to work as well as the stabilization systems we’ve seen on other point-and-shoot cameras having a similar price. It did produce clear images when the camera was shaken subtly, but shaking the camera harder while shooting photos produced some blurry images. As with most Sony point-and-shoots, the camera employs a couple of proprietary formats you’ll have to think about. 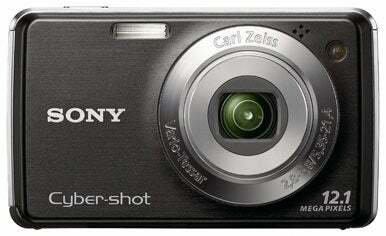 The DSC-W230 uses Sony’s MemoryStick cards as a storage medium, and the included USB cable has a proprietary connector on the camera’s side. All in all, the Cyber-shot DSC-W230 offers a great bundle of features for the price, as well as a great LCD and a wide-angle lens. Its image quality was acceptable, but we’ve seen like-priced cameras that produce better results.